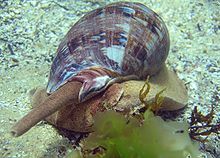 A siphon is a long tube-like structure that is present in certain aquatic molluscs: Gastropods, bivalves, and cephalopods. The tube is used for the exchange of liquids, or air. This flow can have different purposes, the most common are breathing, locomotion, feeding and reproduction. The siphon is part of the mantle of the mollusc, and the water flow is directed to (or from) the mantle cavity. 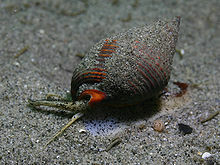 A single siphon occurs in some gastropods. In those bivalves which have siphons, they are paired. In cephalopods, there is a single siphon or funnel which is known as a hyponome. This page was last changed on 3 March 2016, at 14:47.